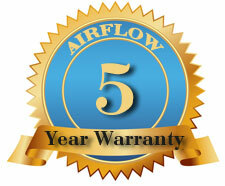 AIRFLOW Appliance Repair - 5 Years Warranty. We at Airflow are very proud of the quality of our work, and we want to make sure your appliances run trouble-free for a very long time. In order to accomplish this, we offer one of the most comprehensive warranties in the industry. Call us or book your appointment on the Internet so that Airflow can prove	that we provide the best service possible, and we make sure our warranty reflects that.